Taste test: These are a new line of chips from Arnott's. They reminded me a lot of the much-missed Ruffles chips in Australia many years ago. While they were a good, crunchy, crinkle cut chip, they were nothing spectacular. I would definitely eat them again, but I wouldn’t be rushing out. 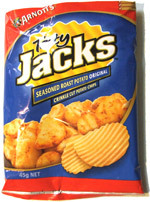 The whole seasoned roast potato flavor just translated to plain, salted chips. This snack was discovered by Mairéad Doolan in Australia. Review published .